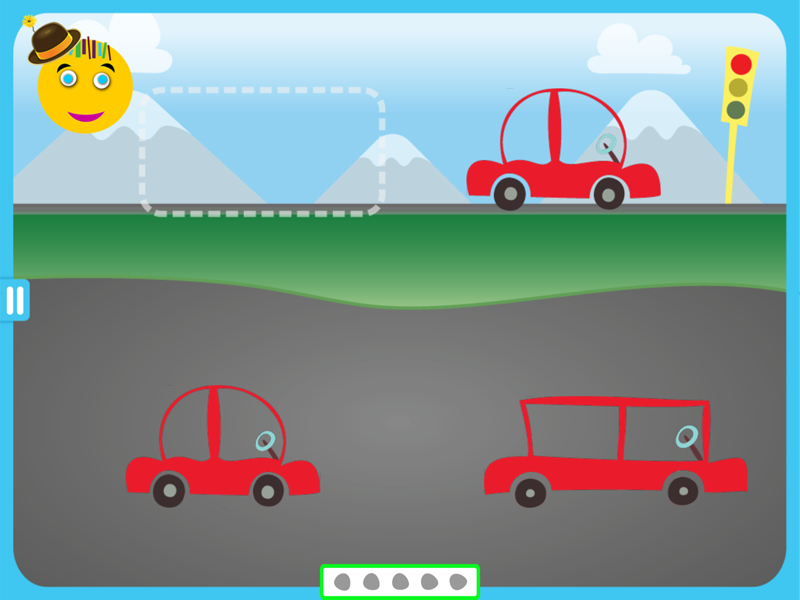 In the Matching Cars game, a child must choose from the selection of cars (on the bottom of the screen) to match the target car that’s stopped at the red light (at the top of the screen). 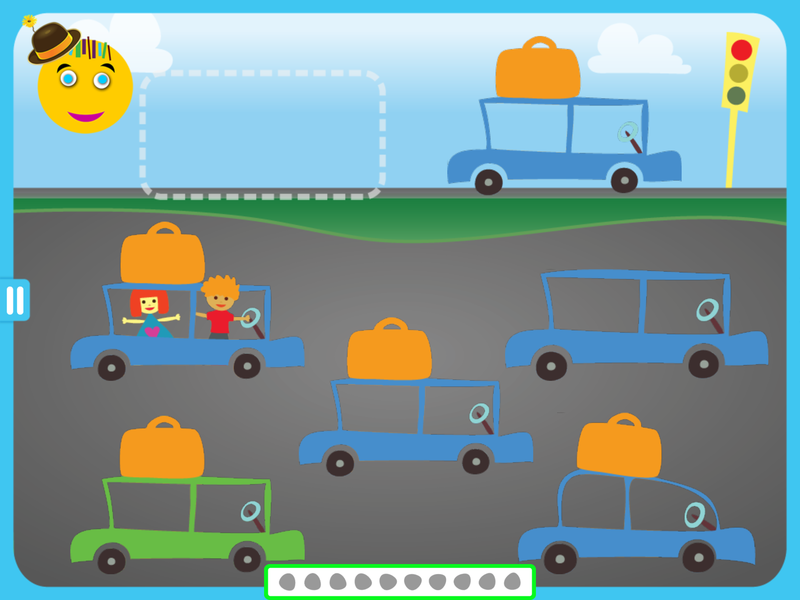 This game combines the two skills targeted by the Outlines and Patches games (attending to shape and color, respectively) and incorporates additional details on the inside and outside of the car, like drivers and luggage, for a child to notice. 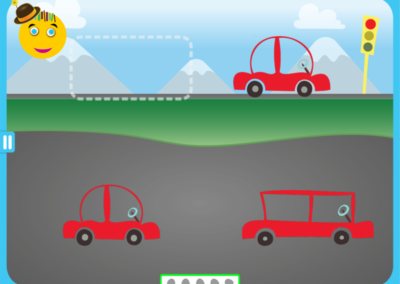 The real value of this game is revealed in the more advanced levels which require simultaneous attention to two, three or four features of a car. 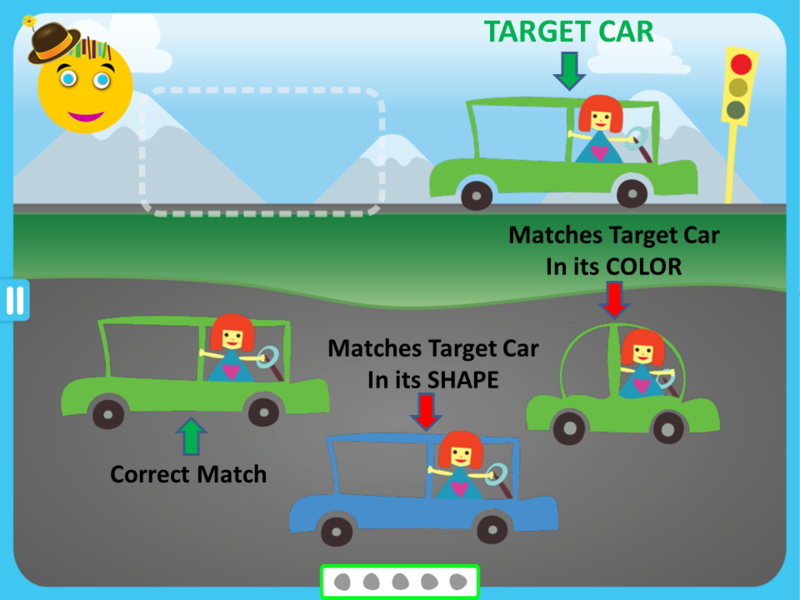 In the puzzle below, a child must notice BOTH the color and the shape of the target car. 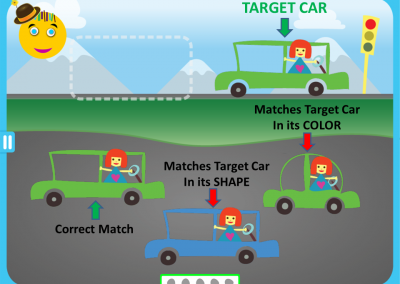 Noticing only the green color of the target car will not be sufficient to find the correct match because there are two green cars among the choices. 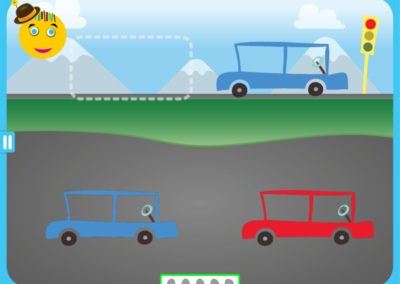 Similarly, noticing only the rectangular shape will also not be enough, as there are two rectangular cars to choose from. 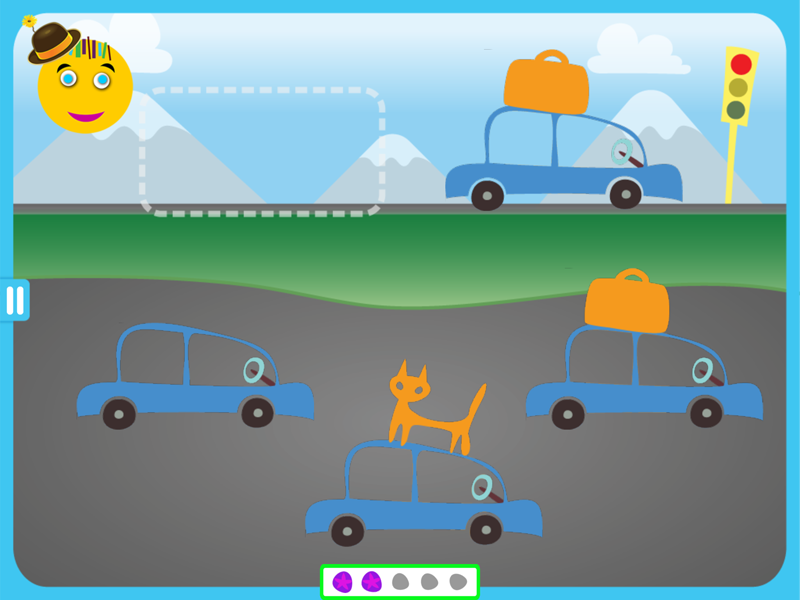 As the levels progress, the game increases in difficulty, requiring attention to more and more features and details of the target car. In the final levels of the game, a child must attend to four features simultaneously: color, shape, inside, and outside of the car. 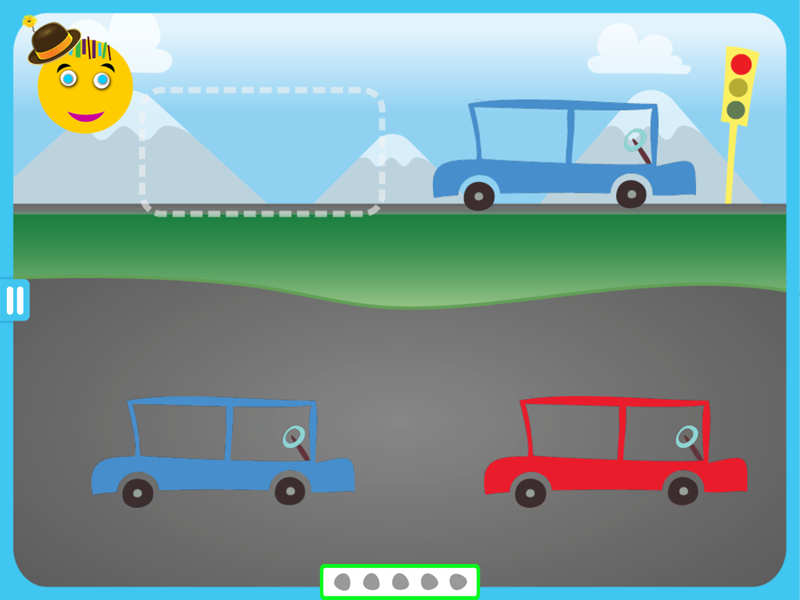 By increasing the similarity of the incorrect choices (also known as distractors) as well as the number of cars to choose from, the game becomes more and more difficult as the levels progress. 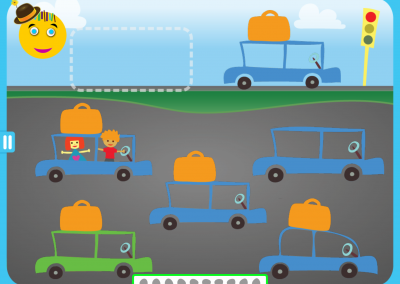 The game teaches a child to attend to multiple cues simultaneously by first requiring attention to only one cue, then two, three, and finally cues simultaneously. This type of gradual practice and incremental increase in difficulty is ideal for targeting stimulus overselectivity.